Samir Zaarur and Felewin like this update. I love where you're going with the history simulation. I think it shows much promise and will yield a far richer gameplay experience than simply relying on procedural generation of events. Keep it up! As a Linux user, I'm not too worried about the Windows build being broken ;) but that jibe aside, very interesting to hear about the background simulation development. Lack of shinyness be damned, it sounds extremely cool, and I know I for one would be quite happy to hear more about those kinds of "invisible" developments in the future. Great work, as everyone else has already indicated. And I applaud your witticisms in the text. "Glistening swords of thought" -- I'll have to remember that one. Amazing as always. I felt so sad that we won't be able to just fly about on the planetary surfaces and explore/do battles on them! I know of course that's not what was promised as part of the first game :); but hey with LT2 who knows! Thanks for the update Josh, it is looking great thus far; keep up the great work! Damn, I wish I had upped to the prototype-level pledge, because I so want to play with this! Thanks Josh. Now I wish there were ancient relics on planets you can discover, explore and gain bonuses from. Brilliant update Josh, Love the background on the simulation. This looks absolutely amazeballs. Keep up the great work! As usual, another good update. I'm glad things are moving along nicely. Unfortunately I need to get some work done before watching the video. Here's a boring question. Anyone know when this will be released? Do we have a better estimate than Jan 2014? I'm only looking for a rough estimate; I expect dates to change. Looking amazing for the time invested so far. How much better can this possibly get? The simulation geek in me, of course, wants to know if worlds will have ground appearances based on weather/atmosphere/hydrosphere, and whether the chemical composition of a world's atmosphere (as well as particulates and liquid vapor) will affect its color. Great work as always -- thanks for sharing this! And please enable city-to-city or destination-to-destination interplanetary travel: Full takeoff, flight and landing sequences. 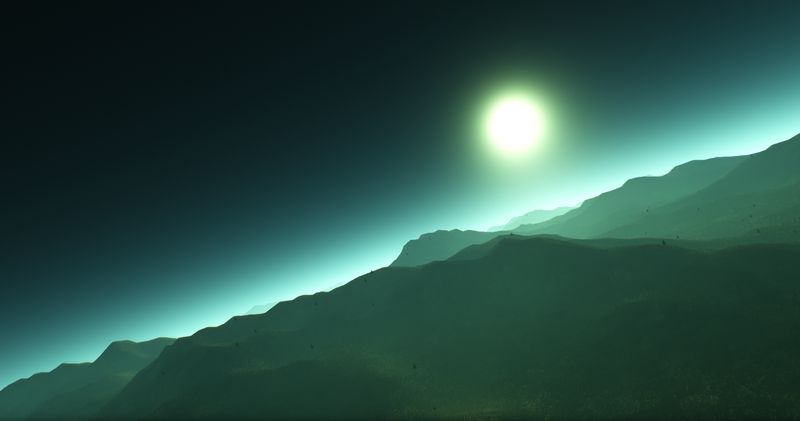 -Longer cut-scene with the ship getting closer to the planet surface. -Atmospheric entry effects (violent camera shaking, audio) with fire alongside the front/underside/sides of the ship. -Fade to white as the atmosphere entry flames become hotter and brighter. 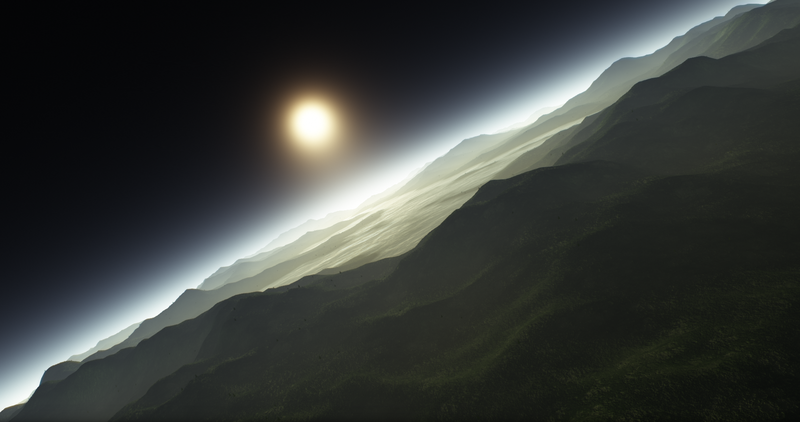 -Start the planet entry scene at a much higher altitude. -Level off the the fire and camera shake to a steady landing speed/trajectory. -Enable some kind of hydraulic stabilizing panels that animate and stick out from the sides/top of ship to reduce speed (similar to when a jet lands and the flaps are up). -Full-sequence flight cut-scene to the destination (w/ skip option). This will still give us the feel of planet surface flight without the need for you to worry about the headaches of free-roaming flight! -Landing sequence scene, at destination. Hey what's your new bro up to? I would love to see development thoughts/progress on the ship/space station design, or anything graphic like that. What program were you trying to use in linux? It REALLY depends on the distro, but I've had good luck with Kazam for screen capture. Probably the best option if you can get into it is avconv (part of the ffmpeg bundle that "converts" one format to another, to use it for this you have the "source file" be the xvideo, etc...). It's complicated, but has fantastic performance! My god... it's full of RAD! @Federico - Well, there is currently no released Mac version. Although I've spoken of an LTP 2.0, I can't promise that the next release will be on Mac as well. However, I will try, because I do want to get it into the hands of our Mac backers ASAP. Stay tuned to see what the next release of LTP brings.